Last Vrooom before our looong summer break! We'll have two special combi sets; Dead Neanderthals who team up with Colin Webster from London, and a duo set from Rotterdam homeboys Machinefabriek and Roel Meelkop. Bart Koppe will be presenting his 'stubborn sound machine' installation. Apart from this you can witness a rare solo performance by Peruvian Christian Galarreta, from Peru, a pivotal figure and activist in the South American experimental music and sound art scene. De laatste (!) Vrooom avond voor de zomerpauze is er wederom een met veel afwisseling op het programma. Zo hebben hebben we naast een solo performance van de Peruaanse Christian Galarreta de welbekende Nijmeegse free jazz necro's Dead Neanderthals die het semi-akoestisch zullen doen met de Londense saxofonist Colin Webster. Intense muziek die zal afsteken tegen de grondtonen, glitches en ruis van Rotterdammers Machinefabriek en Roel Meelkop; electronische luistermuziek van het allerfijnste soort. Bart Koppe presenteert z'n 'stubborn sound machine'. Nijmegen's Dead Neanderthals are a two piece drums & saxophone assault that deal in long and short blasts of music that bring grinding avant greats to mind such as John Zorn's Painkiller, Borbetomagus, MoHa, etc. This evening they're going to team up with Colin Webster, an improvising saxophonist from London, for a special, more acoustic trio set. Machinefabriek's music combines elements of ambient, modern classical, minimalism, drone and field recordings. His pieces unfold as ‘films without image’, with a sharp ear for detail. Besides his vast sound palette, he graphically designs, makes music for films, builds installations and often collaborates with other wellknown (inter)national performers. Roel Meelkop is no slouch either. With the Dutch group THU 20 as his springboard in the early eigthies, he went on to create music with Goem and Kapotte Muziek, and continues to work on his body of work in the small but dedicated world of sound art. Operating from Lima, Chrs Galarreta has a pivotal role in the current experimental music and sound art scene in Peru. He runs Aloardi – the label and main hub for local Peruvian, other South American artists. Peru hasn't got much of a reputation for experimental music but Christian changed that by filtering the sound of Peru / South America to the outside world through his many activities. His performances center upon the usage and mixing of broken electrical appliances, homemade audiovisual instruments, field recordings, feedback systems, music instruments, etc. He makes almost imperceptible physical phenomena audible and creates experimental (song) de-compositions in the process. Bart Koppe has been active as a do-it-yourself media artist since 2005. He mostly develops his creations from re-used, low-budget material, making use of existing techniques and DIY manuals. His works seem to mirror the social aspects of technological progress. 'A Small Stubborn Sound Machine' is a sound device that is 'alive', dreaming up it's own compositions that can be manipulated by outside influences. 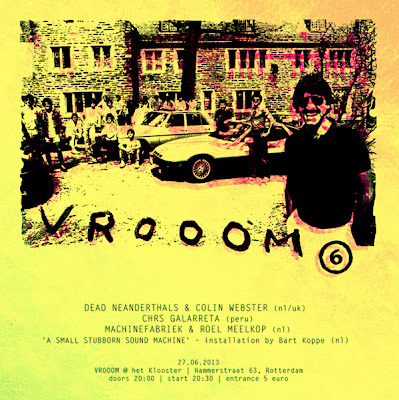 Vrooom is an (ir)regular DIY event series mostly taking place in the north of Rotterdam. We often change between locations so always double check the event locations before you head out to visit us. We focus on experiments in left field music, improvisation, electro acoustic, electronica and performance art, adding dj's, visuals or anything else that excites. Freeform fun, implausibel en overtollig vet! For more frequent updates check our facebook page: https://www.facebook.com/Vrooom.Rotterdam Vrooom is made possible with support from the FPK (Fonds Podiumkunsten), Popunie Rotterdam and Deelgemeente Noord.